1.1But how is this achieved? 1.2What's So Special About That? Nutrobal (MK-677), also known as Ibutamoren, is a research chemical which increases the level of growth hormones (GH) in the body, by copying the hormonal action of ghrelin and increasing the growth factor of insulin. It is often categorized as a Selective Androgen Receptor Modulator (SARM). MK-677 is highly controversial from the time it was developed, and it is widely discussed for its muscle-building properties and the ability to increase the levels of growth hormones in the body. You can easily get it over-the-counter without your doctor’s prescription, although it is advisable to consult a doctor before using Nutrobal to avoid health risk factors. Ibutamoren has a very little support from scientific researchers to backup its beneficial effects, but it has thousands of positive users review from people around the world, who have tested and benefited from it in different ways including workouts and fitness. One more thing; it can be used frequently as a long lasting, orally-active anabolic substance to create bigger muscles in the body. Ibutamoren increases the growth hormone levels when introduced to the body, and this helps in building the muscles. When you use MK-677, it starts mimicking the hormonal action of ghrelin, so that it can be attached to the body’s ghrelin receptor (GHSR). By doing that, these receptors are activated, and thus increases the growth hormones secretion by sending signals to the pituitary gland. Also, the ghrelin receptor (GHSR) works on the different regions of the brain that controls pleasure, memory, mood, appetite, biological rhythms, and cognitive functions, so you should expect changes in these regions with your continuous intake of the MK-677. 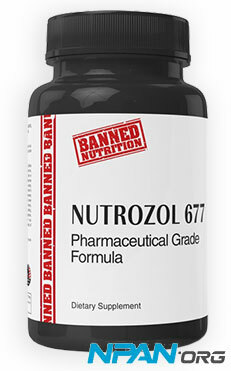 One unique thing about Nutrobal is that, while it increases the growth hormone levels of the body, it has no effect on the cortisol levels of the brain. This cortisol is the hormone which surpresses the immune system of the body, and impairs the cognition and brains memory. This hormone (Cortisol) level must be kept at a normal range if it must function properly. Most muscle building supplements cannot offer such ability. MK677 helps in building strong muscles while eliminating fats from the body. Increasing fat oxidation in the body creates an opportunity for fat reduction, leaving you with a lean, great-looking and vascular muscles. MK677 helps the body tissues, ligaments, bones and tendons, to regenerate, and wounds to heal faster with the increase in growth hormone secretion in your body. Your bones will also become strong and healthy due to the ability of the growth hormone to improve the density and turnover of the bones. Using MK-677 will increase your appetite, and your body will be able to absorb more calories to grow your muscles, while in the actual sense, you’re losing weight from fat oxidation and regular exercise. By increasing the growth hormone levels and the insulin-like growth factor 1 (IGF-1), ibutamoren can build muscles faster. You’ll also gain strength in your body as your appetite increases. People who are obese may have sagged skin after losing weight. Their loosed skin may pose problems to them and could cause lack of self-confidence after shedding the extra body pounds. MK-677 helps improve the quality of skin and tightens the skin after loss of weight. Ibutamoren helps improve the quality of sleep and sleep duration in younger and older people. Children with deficiency in growth hormones can have their growth hormones, IGFBP-3, and IGF-1 levels increased with Ibutamoren without affecting the glucose, thyrotropin, prolactin, insulin, cortisol, thyroxine (T4), or triiodothyronine (T3) concentrations. For best results, endeavour to use Ibutamoren Nutrobal for 3 months or more with 25mg as the average daily dosage. MK-677 could be used as a single dose daily, but the most ideal dosage is 12.5mg twice daily, and it has a half-life of 6 hours. For bulking, it should be stacked with RAD140 (Testolone) of 10mg daily. For cutting, it should be stacked with GW501516 (Cardarine) of 20mg daily. You can also stack it with any other Selective Androgen Receptor Modulator. Ibutamoren can also be stacked with anabolic steroids for strength and muscle gain, cutting and bulking. For body building, combine 25mg daily of MK-677 with 150mg weekly of Testosterone Enanthate and 500mg weekly of Primobolan. 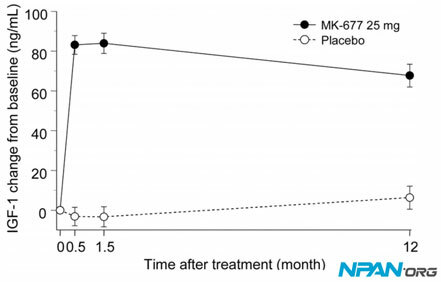 The intake of MK677 comes with some side effects such as an increased appetite, lethargy, muscle and joint pain, and a decrease in the sensitivity of insulin. Pregnant or breastfeeding women should consult a doctor before taking Nutrobal, although, no report has been made about its effect on breastfeeding and pregnant mothers. Also, consult a doctor first if you’re placed on any medication because, taking Ibutamoren can affect the potency of other medications. Cancer patients should not use this SARM, since it increases IGF-1 and growth hormones secretion which could promote cancerous growth. We do not recommend the usage of Ibutamoren for people under 21years. Tested athletes should avoid MK 677, since it is against sports ethics and you could be tested for it. Men and women, underweight and overweight are considered safe for its usage with very few exceptions. Ibutamoren Nutrobal is preferred to other growth hormones because, it is not injected and it’s affordable. It is in a capsule form and you don’t have to mix, preserve, or inject it. Other growth hormones may be very expensive but MK-677 does not cost a fortune. Ibutamoren (MK-677) is a very popular SARM that will give you lean muscles, great looks, and muscle strength, without adding extra weights even with the frequent intake of calories needed by your body. Nutrobal is trending in online discussions and has won over the heart of several users, and we are certain that, it’ll surely win yours as well.